Located on the remote northern tip of Koh Yao Noi, TreeHouse Villas is an adults-only luxury resort offering spacious airconditioned villas dotting the border of lush tropical forest, towering limestone cliffs, and 400 meters of private beach. 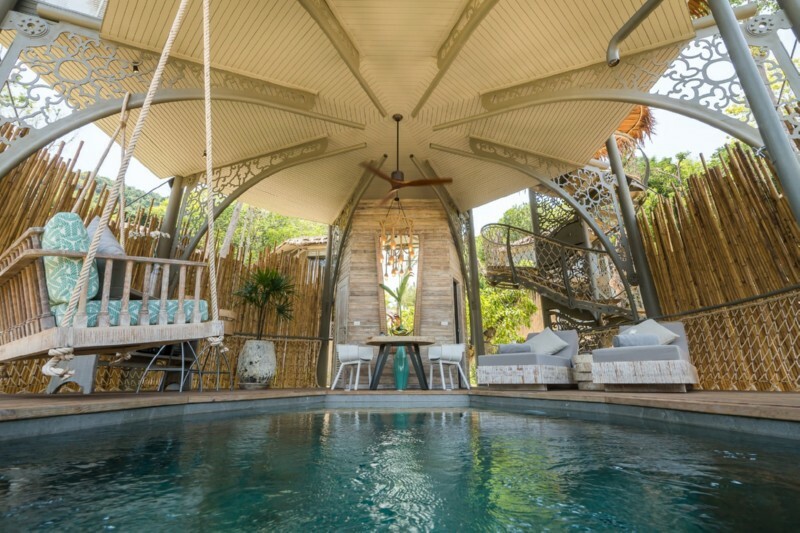 Enter each of the signature TreeHouse Villa over a suspension bridge. Where downstairs guests will find the spacious outdoor deck-area with a private plunge pool, dining area, sun beds and stand-up bar with a mini-fridge and mini wine-cooler. Upstairs is the luxurious airconditioned bedroom with a grand king-sized bed, flat-screen TV, balcony with views of Phang Nga Bay, and spacious bathroom with the unique hammock shaped bath. Guests can make custom requests for in-villa dining, spa, yoga, or book excursions through the e-butler tablet system. Each Treehouse is set for max 2 adults with minimum age of 16 years. No children are allowed. This is a perfect place for a couple to have a romantic experience. The island of Koh Yao Noi is only accessible by boat. The resort provides transfers from international airports or hotel in Phuket or mainland Krabi for a fee.